Porcelain Vintage Signs, Antique Vintage Tin Metal Signs: You name them, we have them. If you look through the history and their data, Antique Porcelain Signs, Neon Signs, Vintage Tin Metal Signs, Old Porcelain Vintage Signs are among the most collectible signages of all time. It is available in various shapes, sizes, varieties as well as brands. When we hear the word ‘Vintage,’ the first thing that clicks in mind is something which is way too old but happily carries their design and calligraphy to even modern era. Many of the signages are specially crafted using special techniques which involves stencilling and using various chemicals for an everlasting appearance. With each passing day, the demand and value of such vintage signages are surging. As per reports, these days, the demand for Gas & Oil, Automotive and other rare signs are in huge demand. The more time signage takes to complete; higher is its worth. I own an extensive collection of Antique Porcelain Signs. I collect, buy, and sell all these types of signages. Exxon, Gulf Hancock, Husky, Marathon, Mobil, Esso, Shell, Chevron, Holiday, Clark Conoco, Sunoco, Orange Crush, 7-Up, Bubble Up, Coca-cola, Pepsi, soda, grape crush, orange crush, Lemon. Dr. Pepper, and thousand other soft drink makers. Antique Porcelain Signage of many daily use products like tobacco, chewing tobacco, cigarettes, cigars is available. You can select from various shapes, sizes, and styles.The range of vintage collection further extends to fashion products. Signs of clothing, jeans, shirts, shoes are a part of our collection. Not to mention, transport advertisement signages like trucks, cars, boats, ships, trains buses, plans, automobiles are also available. Within Airline sector, various big companies porcelain signages are available. List of airline management companies includes United Airlines, Southwest Airlines, Northwest, TWA, etc. There are numerous flight manufacturing companies antique porcelain signs like Boeing, Beechcraft, Cessna, Piper Cub are a part of the collection. Porcelain signs of buses companies like Trailways, MTA, Greyhound, Jefferson, etc. can be easily found. Railway porcelain signs of rail line divisions like Great Northern, Soo Line railroad, the transcontinental, short line, the triangle lines are the pride of our collection. These Antique Porcelain Signs are extremely collectible, and their worth regarding money and value makes them more than just a collectible. As per requirements, you can get antique porcelain signs of various shapes, sizes, color, and styles. Due to its unique art and everlasting beauty, antique porcelain signs the preferred when collecting. Here is a sample gallery of our collection of antique porcelain signs. Despite considerable effort, we are not able to display all our collection. But we keep our gallery updated every other day to let you select your favorite one. Old Antique Signs and Vintage Porcelain signs are in demand and highly collectible. We are talking about these vintage signs for quite some time. And it reflects how people are dying to have one in their home. The vintage advertising signs and old porcelain signs possess an immense value, and that rises their demand. They carry a historical significance from generation to generation. And their long-lasting beauty makes them a perfect piece to decorate your wall or enhance your collection. To give you a fair idea, we have a vast collection of advertising signs from A-Z companies. However, a majority of the collection comprises of Automobile, Oil & Gas, Household appliances, beer, food, soda, etc. During those time, the styles in the mainstream were Wood, Zinc, Tin Lithography, Porcelain. As the technology and printing witnessed substantial growth, they changed the way marketing was done. So, it was logical to expand our collection and include tin, LED’s, plastic, cardboard, vintage porcelain signs in our collection. Let us discuss the history of porcelain signs. It all started back in the 1880’s and was first implemented in Europe later moved to the USA. However, the Americans then began manufacturing their porcelain signs during the 1890’s. There are various ways to make porcelain. However, we are stressing on the traditional one. It includes many color Powdered glass to be first stenciled, then joined together by baking to the rolled steel. After a few hours, the powder was silk screened to the steel. The outcome of such procedure results in a sign full of details, durable, tremendous build quality and long-lasting. But, due to increased technology and higher cost, the porcelain sign concept soon vanished from the market. Then came the era of Tin. Though tin was not that durable, still people preferred because of its low cost. The period for Vintage Tin Metal signs existed till 1920’s. The procedure to print on the tin was different. Techniques like paint, screen paint, lithography, or stamp were used to create signboards. Neon Sign boards replaced the Vintage Tin Metal signs during the 1920’s. A barber shop named Paris Barber first took neon signs help for its advertisement. However, the making cost of those neon signs was pretty high. Since the neon bulbs were hand-blown and later bent to give it the desired shape, the human involvement increased its cost. The further process includes infusing neon or any other noble gas inside the glass chamber. Then the gas-filled glass was exposed to very high voltage to give it the desired effect. Due to fragile, very fewer tubes could pass the whole quality check test before converting into the neon signs. 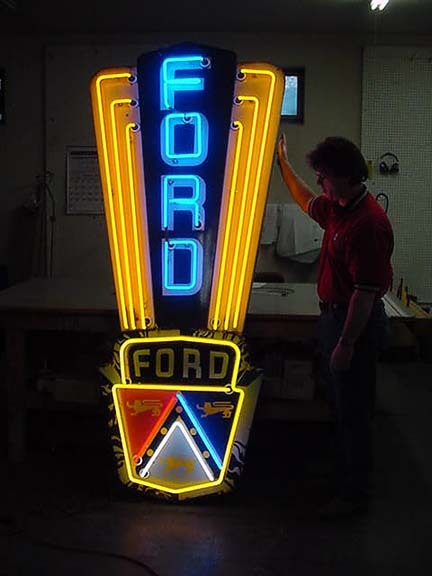 The Neon sign remained popular till 1950’s. Various custom-made signs were used for advertisement. Small businesses like bars, restaurants, clubs, auto dealerships were the prime customers of Vintage Neon Porcelain signs. Other businesses who implemented later includes various soda, beer, tobacco, candy companies and future events. Though we are mentioning only porcelain, tin or neon here, our collection is way much more than that. To give you a rough idea, these are the things you can find in the collection: cardboard, glass, Door Pushes and Pulls, Paper. As you all know, there are many collectors in the market looking for a specific field of signs and collectibles. However, we are different. For us, anything vintage is worth collecting. Due to this very reason, we sell, buy, collect A-Z antique advertising signs. If you plan to collect signs and antiques, please do your homework first. Otherwise, you will end up purchasing a fake art using your hard-earned money. Learn to recognise the false and the original one. Also, don’t get attracted to shiny things. Last but not the least, beware of frauds and thieves selling counterfeit products.